The site of coastal erosion in Rosemarkie. A community council has warned against “emptying” a pot of cash for a coastal erosion project – as it will stall other projects. 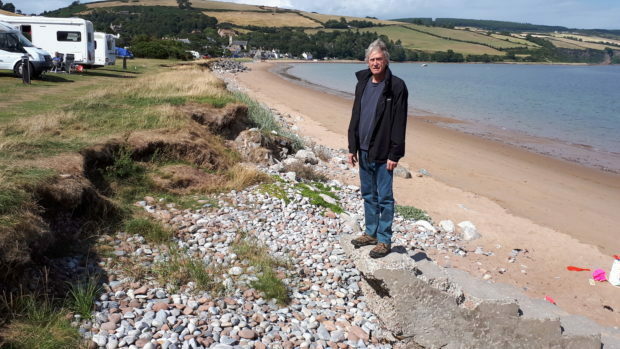 Fortrose and Rosemarkie Community Council believe too much is being taken out of the local Common Good Fund to prevent coastal erosion at Rosemarkie. The work, estimated at £187,000 will be funded from Common Good to the tune of £137,000, with the tenants of the affected area, the Camping and Caravanning Club (C&CC), contributing the remaining £50,000. But community council chairman Tom Heath last night claimed the Highland Council-negotiated deal favours the caravan club at the expense of the Common Good Fund. He said: “The council agreed that the C&CC’s lease would not be raised in line with inflation until the end of the lease in 2026, and beyond that to 2030. “We feel that at just over £6,000 annually the rent is too low from one of the C&CC’s most successful sites. “We question the assumption that their lease will simply be extended, rather than being put out to tender to establish the true value of the site. Mr Heath, an expert in wave energy development, also questioned the wisdom of “emptying” the fund to protect a small length of coastline when sea defences are failing right along the coast. Common Good funds are administered by Highland Council, with all councillors as trustees. The council passed the Rosemarkie project in May, with the contract for the work out to tender until August 24. Black Isle councillor Gordon Adam said while he had considerable sympathy with Fortrose and Rosemarkie Community Council, the negotiated deal was the best available. He said: “Council officials worked very hard to get this deal. “The erosion had to be dealt with urgently, or the lessees could have sued the council. “We looked at the community council’s arguments but weren’t convinced they offered any particular alternative. Rosemarkie campsite opened in 1987 and has 65 pitches.